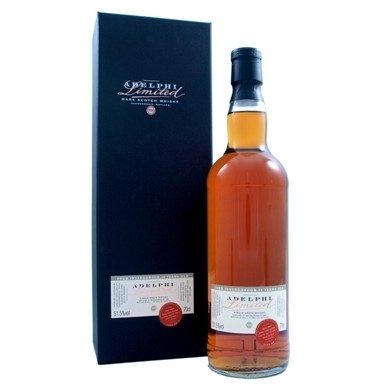 An intriguing look at an extremely rare and mature single grain whisky from this famous northern distillery. A mid amber colour with copper lights and a light bead. Alcoholic fruit salad to start, possibly even rum toft. Bags of coconut and caramel behind this, with a thread of linseed oil. The fruit salad returns, now as orange peel soaked in brandy or even Bourbon. A very thick mouth feel with milk chocolate and Highland toffee drying in the finish. Water introduces fresh oil paints and cigar box with memories of a warm summer’s day in the sand dunes – possibly the coconut oil suntan lotion! An old and venerable whisky to be savoured over a long evening.